Premier Mario Monti has called a Cabinet meeting in Rome on Sunday to approve emergency austerity and growth measures aimed at saving the euro currency from collapse. 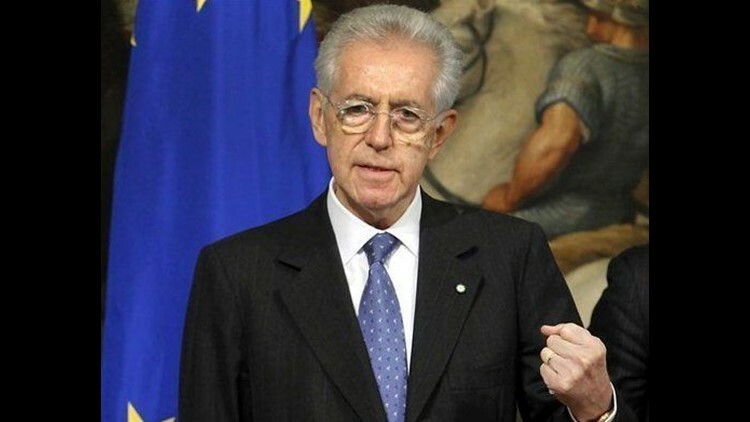 MILAN (AP) — Premier Mario Monti has called a Cabinet meeting in Rome on Sunday to approve emergency austerity and growth measures aimed at saving the euro currency from collapse. Monti is under extreme pressure to come up with speedy and credible measures that will persuade markets to stop betting against the common currency. The Cabinet was originally scheduled to meet Monday, but was moved up following Monti's weekend of meetings with political parties, unions, business groups and consumer lobbies. The premier hasn't disclosed details of his rescue plan, but has said it includes both austerity cuts and measures to boost growth in Italy's anemic economy. He has promised it would be socially equitable, and that it would go after those who hadn't paid their share of taxes before. The various parties briefed have said the package likely includes reinstating an unpopular home property tax abolished by Berlusconi, raising the sales tax and the income tax at the highest brackets by a few percentage points, and requiring Italians to work more than the 40 years now needed to receive a pension. The head of Italy's industrial lobby said Sunday that the survival of the common euro currency depends on Italy's coming up with very strong austerity and growth measures — followed by a concerted effort at the European level so that Italian sacrifices are not in vain. Confindustria President Emma Marcegaglia told reporters after meeting with Monti that the measures are "very heavy." The coming days "will decided if the euro will survive or not. The first move to save the euro is in Italian hands, with a very strong measures," Marcegaglia said. The measures will be "fundamental to saving Italy and to saving the euro." Italian borrowing costs have spiked, which could spell disaster if Italy is unable to keep up on payments to service its enormous debt of €1.9 trillion ($2.57 trillion), or 120 percent of its GDP. Unlike Greece, Portugal and Ireland, which got bailouts after their borrowing rates skyrocketed, the eurozone's third-largest economy is considered to be too big to bail out. An Italian default would be disastrous for the 17-member eurozone and reverberate throughout the global economy. Union head Raffaele Bonnani, however, urged Monti to reconsider raising the pension age across the board, saying that workers in hard labor should be allowed to retire without added requirements, and that women who join the work force after raising children might have to work well into old age if the 40-year seniority requirement were raised. But he said he was against calling a general strike at this sensitive moment, and would instead pursue a policy of negotiation with the government. Marcegaglia said the measures were concentrated on raising taxes — and to balance that she called for an immediate look at ways to cut political and bureaucratic spending. "This kind of fiscal pressure is not sustainable," she said.